The Hyundai Theta engine appeared in 2006 Sonata models and is going strong to this day in naturally aspirated and turbocharged forms in various Hyundai and Kia applications. The one area of the engine that has been the source of more TSBs and tech tips has been the bottom end of the engine and lubrication system. Part of the problem can be pinned to owners neglecting oil changes; the other part occurred at the factory. 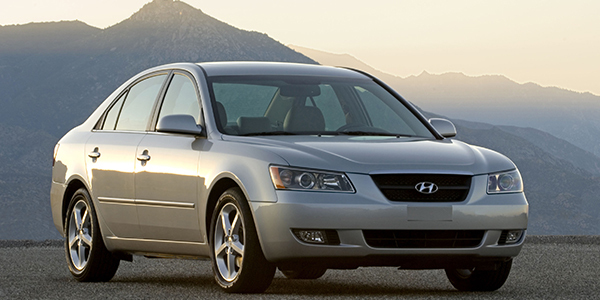 Hyundai and Kia have issued multiple recalls for the Theta engine and issues with the oil passages in the crankshaft causing rapid wear to the connecting rod bearings. According to the recall documents, metallic debris was not removed from the engine crankshaft during the deburring process. The debris restricts oil flow to the connecting rods. The symptom of the damage is a metallic, cyclical knocking noise that is caused by wear to the connecting rod bearings. Some engines have seized due to the damage and even caused fires. Hyundai’s procedure to determine if there is an issue with the connecting rods involves using its GDS factory scan tool. The procedure tests the engine at specific engine RPM ranges with a special microphone in the dipstick tube. The test will generate a pass or fail result. At the dealer, the tool records a sound file for the warranty department. In later recall documents, Hyundai and Kia have increased the oil capacity of the vehicle, from 4.6 quarts to 5.0 quarts, noted by a change in the color of the dipstick. 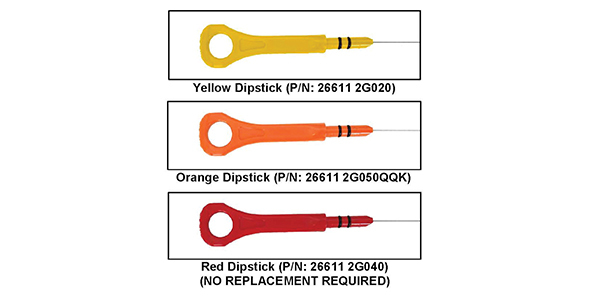 On some vehicles, there are three color codes for the dipsticks. A yellow dipstick is the original dipstick and indicates that the engine has not been inspected. If you see one of these dipsticks, check to see if the recall applies to the vehicle. An orange dipstick indicates the engine has been tested and passed the test. It can also indicate that the oil capacity could be different than your service information. The red dipstick means that the engine has been replaced under the recall. If the engine is making a knocking noise, it is now the customer’s fault. What Does This Mean For Your Customers With A Theta Engine? Wear of the connecting rod bearing can occur on any vehicle if the oil change interval is passed, or if the wrong oil is used. 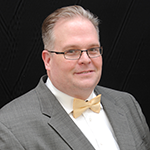 If you have a customer who drives a Kia or Hyundai with a Theta engine, the chances are slim that there is an issue with debris in the crankshaft causing wear to the connecting rod bearings. 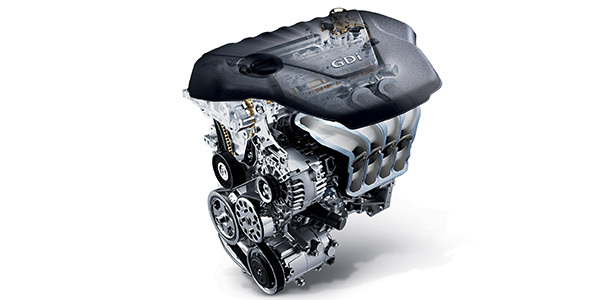 But, neglected maintenance can make the problem occur in Theta engines that don’t have the defect. Another favor you can do for the customer is to reflash the ECM with the latest calibrations. Hyundai has updated the software to protect the engine and prevent catastrophic engine failure. The knock sensor detection system software continuously monitors engine vibrations for unusual dynamic patterns that develop, as an engine connecting rod bearing wears abnormally in a way that could later cause engine seizure. If vibrations caused by bearing wear start to occur, the malfunction indicator lamp will blink continuously, an audible chime will sound (in certain models) and the vehicle will be placed in a temporary engine-protection mode with reduced power and acceleration. In this temporary mode, drivers maintain full control of the vehicle as brakes, steering and safety devices such as airbags remain operational. The vehicle can continue to be operated for a limited time in engine-protection mode to enable the customer to safely drive it for inspection and repair. But, acceleration will be slower, with a reduced maximum speed of approximately 60 to 65 mph, and a limited engine speed of approximately 1,800 to 2,000 rpm. More details on Hyundai’s engine recalls and the knock sensor product improvement campaign can be found at hyundaiengineinfo.com.